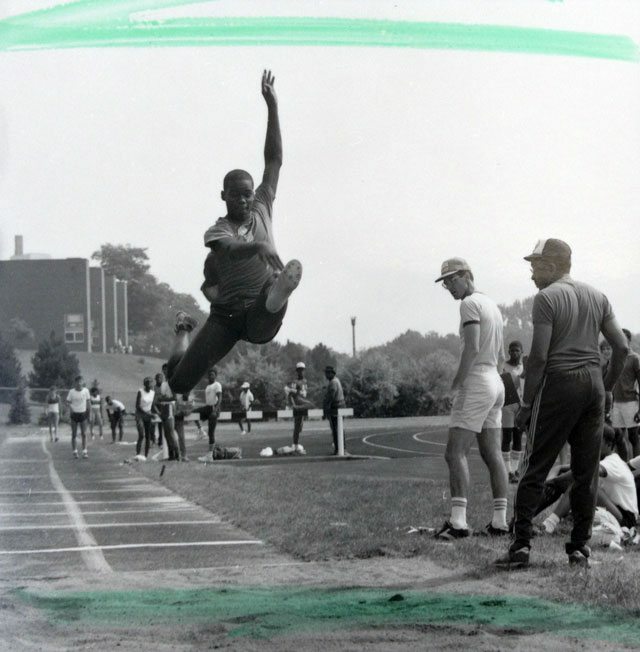 For 32 years, starting in 1973, amateur athletes from Scarborough regularly tested their sporting prowess against the people of Indianapolis, Indiana. 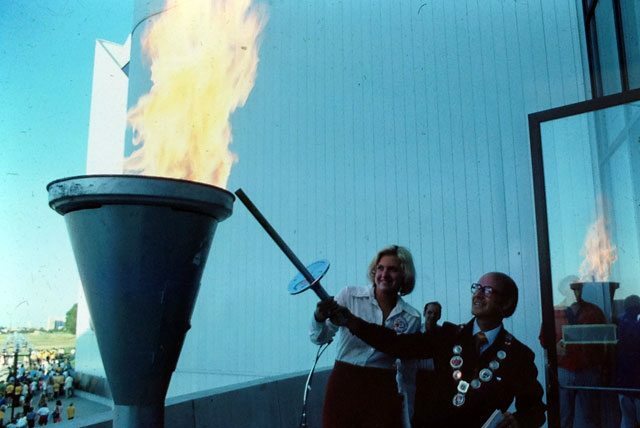 Scarborough mayor Paul Cosgrove lights the Peace Games flame at the Scarborough Civic Centre with long-distance swimmer Cindy Nicholas. Photo from the City of Toronto Archives, Fonds 218, Series 1762, File 114. Great rivalries: The Maple Leafs and Canadiens, the Blue Jays and Orioles, and Scarborough and Indianapolis? 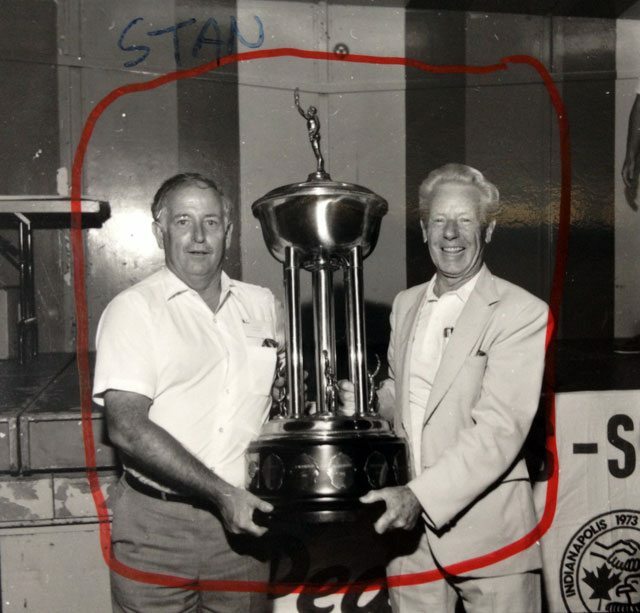 Despite their geographic and cultural differences, starting in 1973 close to 1,000 athletes from the borough of Scarborough and the U.S. city of Indianapolis participated in a recurring amateur sporting event in the name of friendship and goodwill. 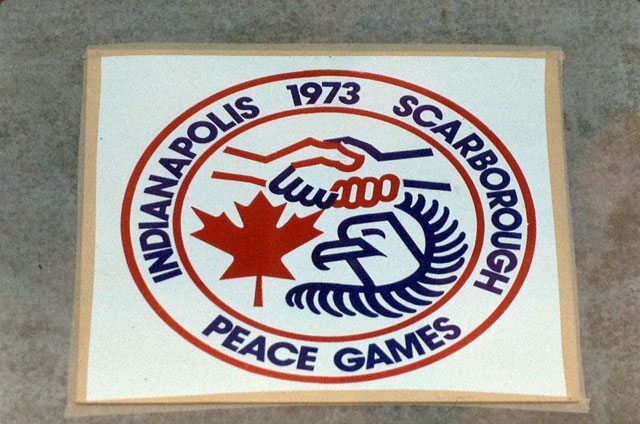 The Scarborough-Indianapolis Peace Games—named in honour of the peace treaty that led to the end of the Vietnam War—were initiated by Gene McFadden, an Indianapolis urban planner and community development specialist, in October 1972. 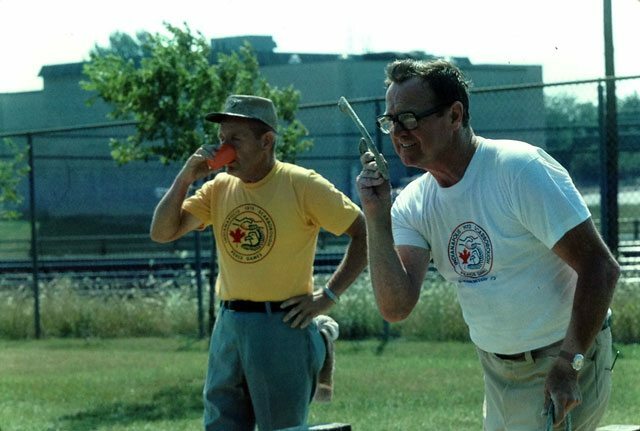 McFadden was interested in finding a Canadian counterpart willing to compete in a multi-sport event similar to the Olympics, so he contacted George Churchill in Brantford, Ontario. Churchill had helped organize a similar event between Brantford and Berrien County, Michigan, and, at McFadden’s request, he sent letters to several Canadian cities he thought would be interested in participating. Scarborough Director of Recreation Jack Keay was first to respond, and he was keen. It took almost a year of planning, but the first Peace Games were held in Scarborough in August 1973. A total of 843 American athletes ranging in age from 10 to 55, their coaches, and associated dignitaries made the 840-kilometre trip north from Indianapolis. A massive welcome ceremony was held at the brand new Scarborough Civic Centre, which had opened just a month earlier. Eight cyclists who rode 51 hours from Indianapolis were the guests of honour responsible for lighting the inaugural Peace Games flame. “What we were striving for was a ‘total’ weekend—simply an exchange of friendships,” said Sarah Meeker, vice-president of the Indianapolis team. The Peace Games were named by the city of Indianapolis to mark the signing of the Paris Peace Accords, which led to the end of direct U.S. military involvement in the Vietnam War. Photo from the City of Toronto Archives, Fonds 218, Series 1762, File 10. There were no individual awards at the Peace Games. In each race, match, or game, the winning city was credited with a point. The city with the most points won that sport. The city with the most sports won the games overall. Over the course of the weekend, Scarborough won six events: softball, soccer, badminton, table tennis, volleyball, and golf. The United States also had six victories, in swimming, baseball, basketball, tennis, horseshoes, and kickball. The kickball tournament was rather lopsided due to the Canadians’ lack of familiarity with the sport, which is a combination of soccer and baseball (the batter kicks a leather ball instead of swinging at a pitch). The record shows scores such as 53-3 and 60-0. Scarborough had an advantage in the softball tournament, thanks to the Americans’ lack of experience with the fast-pitch style played north of the border. Bendale pitcher Jim Anderson was on the verge of a perfect game until he accidentally hit a batter. 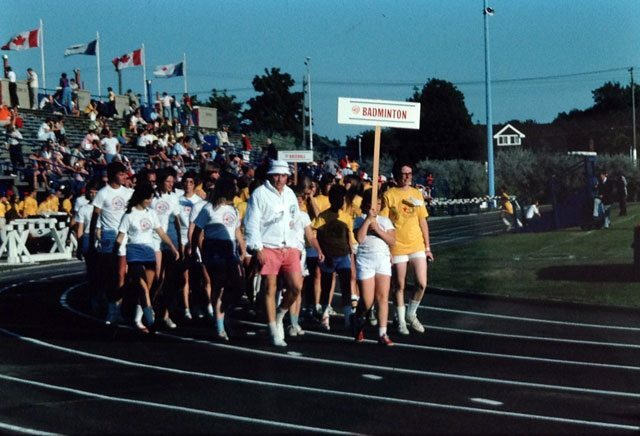 The first Peace Games were decided at the track and field tournament on the final day, which Indianapolis won by a hair at Birchmount Stadium. The final score was Scarborough 6, Indianapolis 7. The early Peace Games included 13 events, but the number later grew to 15 plus several exhibition events. Photo from the City of Toronto Archives, Fonds 218, Series 1762, File 10. The cost of hosting the games and transporting athletes became a recurring problem after the second year. The Indianapolis team was backed by Eli Lilly pharmaceuticals to the tune of about $100,000, but the Scarborough team relied on small donations from local businesses and sports associations. Nevertheless, the Games were repeated the following August, in 1974, in Indianapolis. Approximately 1,000 Scarborough athletes and coaches made the journey along with Scarborough Mayor Paul Cosgrove. In the U.S., the Canadian athletes were treated to a police-escorted bus tour of the city, which included a 35 mile-per-hour lap of the Indianapolis Speedway. Mayor Cosgrove and aldermen Ed Fulton and Shirley Eidt got tours of local park and recreation facilities. This time around, the margin of victory was much greater for the Americans, who won eight events to Scarborough’s five. Crucially, the Indianapolis athletes had improved in softball, taking the event away from Scarborough. 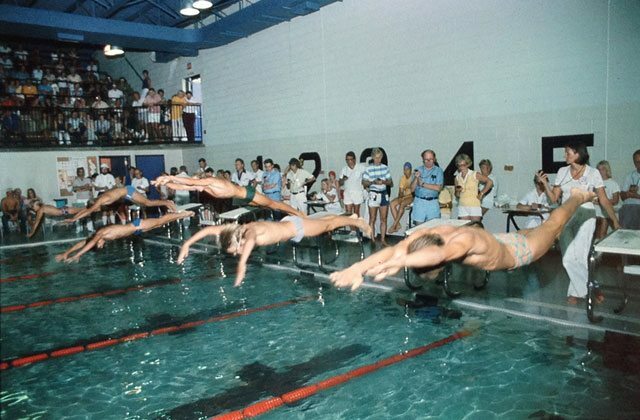 The Americans dominated in the pool, winning 45 of the 52 races held during the inaugural 1973 Games. Photo from the City of Toronto Archives, Fonds 218, Series 1762, File 10. It appeared the Canadians’ visit taught the local Midwesterners a lot about life north of the border. “Everybody’s just starting out up there just like we did years ago,” he said. Mary Firman, a Toronto expat living in Indianapolis, said most Americans had a confused image of their neighbours. “Maybe if we do more of this type of thing Americans will learn we’re not all Eskimos who live in Igloos,” she said. The second Peace Games took place amid the political fallout from the Watergate scandal. Hopelessly mired in controversy and facing almost certain impeachment, Richard Nixon resigned as president on August 9—the day of the opening ceremony. After the party, the Scarborough group, including Mayor Cosgrove, went to a steakhouse to watch Nixon’s resignation speech. “You could have heard a pin drop in that room,” Cosgrove said. Many of the outdoor events, such as track and field, were held at Birchmount Stadium in Scarborough. Photo from the City of Toronto Archives, Fonds 218, Series 1762, File 3231. The third games was another close affair, but the Indianapolis team won again, 7-6 overall. This time the kickball tournament was abandoned entirely (perhaps on humanitarian grounds) and replaced with wrestling, which the Americans also won. There was controversy in the build-up to the fourth games. The Scarborough mens’ senior softball team refused to be billeted with their Indianapolis counterparts, preferring instead to stay in motels or hotels with their partners. The organizers stood firm, and the team pulled out of the event entirely. To fill the hole in the schedule, Bob Hull, the sports co-ordinator of the event published his telephone number in the Star to try and attract replacement players. In the end, the ad-hoc team included Scarborough mayor Paul Cosgrove. Again, Scarborough lost overall. The Canadians eventually won their first tournament in 1977 when the Games expanded to include 15 events, including gymnastics and volleyball. These Games included a mayors’ challenge, which pitted Cosgrove against his American counterpart, William H. Hudnut III, in a “grudge match” of horseshoe pitching. At the 1978 Games, Cosgrove and Hudnot, a competition tennis player, faced off in a pentathlon: javelin, 440-yard speed walk, shot put, 50-yard dash, and long jump. Horseshoes was one of the more unusual events at the first Peace Games. The event was later contested between the mayors of the two cities. Photo from the City of Toronto Archives, Fonds 218, Series 1762, File 114. With their first win out of the way, the Scarborough team went on a roll, matching Indianapolis’ number of tournament victories in 1984, 6-6. In 1985, Scarborough took the lead, only to lose it by 1990 and regain it again in 1995. Despite the Peace Games’ popularity among participants, it always struggled to garner much publicity. In 1981, Toronto Star reporter Dorothy O’Neil was met with blank faces and shrugs while trying to discuss the upcoming event with people on the street in Scarborough. In 1987, Prime Minister Brian Mulroney and President Ronald Reagan declined to attend the Games, despite the pair having just declared July 1-4 official Canada-United States Friendship Days. Visiting athletes often billeted with the people they were due to compete against. Photo from the City of Toronto Archives, Fonds 218, Series 1762, File 3231. 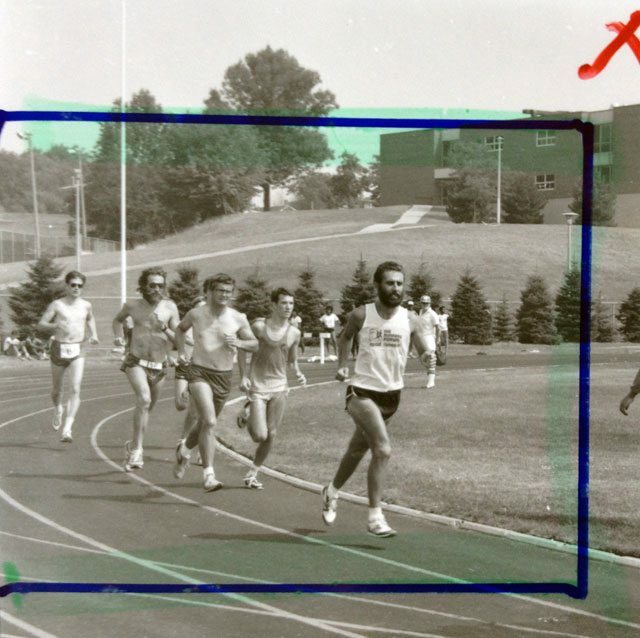 The Peace Games started running every other year in the early 1980s, but finding funding was always problematic. Scarborough relied heavily on charity bingo matches and small grants from its city council, which tended to be unpredictable. Despite the financial hardships, the Games expanded to incorporate new sports, such as cross-country running, bowling, and chess in the 1990s. A list of non-scoring demonstration events were also added to the roster, including synchronized swimming and trivia quizzes. Outside the competition, the athletes and their families socialized and made friends. The goodwill fostered between the two cities peaked in 1996 when Mayor Frank Faubert and Mike Yoder, the director of the department of administration in Indianapolis, signed a sister city agreement. The official status only lasted until 1998, when East York, Etobicoke, North York, Scarborough, and Toronto amalgamated to form the current City of Toronto with its own set of sister cities. Though the games were primarily meant to foster friendship and goodwill, a trophy was presented to the overall winner at the competition. Photo from the City of Toronto Archives, Fonds 218, Series 1762, File 3231. Unfortunately, the Peace Games ended with a whimper in 2003. The event was due to be held at Birchmount Stadium in Scarborough that year, but the SARS outbreak prompted officials in Indiana to pull out. In January 2005, both cities mutually agreed to call it quits. Participation was down and sponsorship dollars were increasingly hard to find. “Both communities have decided it’s run its course,” said Jim Wade, the president of the Scarborough Games board. “Over 50,000 kids were able to travel to a foreign country, stay with peers, engage in competitive sports, but with the understanding that sports isn’t everything,” he said. Additional material from August 10, 1973, editions of the Globe and Mail; August 10, August 13, 1973, January 30, August 12, 1974, August 8, August 11, 1975, July 30, August 4, August 9, 1976, August 5, 1977, August 9, August 14, 1978, June 16, August 10, 1981, August 21, 1984, August 20, 1985, June 9, June 30, July 14, 1987, August 8, 1988, July 11, July 25, 1989, August 2, 1990, June 13, June 20, 1996, July 24, August 14, 1997, February 18, 1999 editions of the Toronto Star.